We offer a wide range of services and installations. For a quote or more information, please Contact Us. 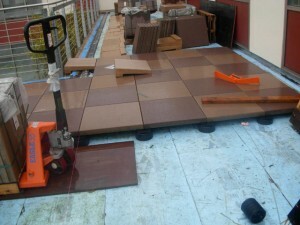 Typical uses: Paver on pedestal systems are typically installed on large roofs and plaza decks. These systems allow the finished floors to remain level even though their substrates are sloped. These systems require little to no maintenance and are easy to repair if damaged. These systems are combined with various waterproofing membranes for a complete traffic system.